The Forbidden Kingdom of Mustang is one of Nepal’s greatest national treasures. 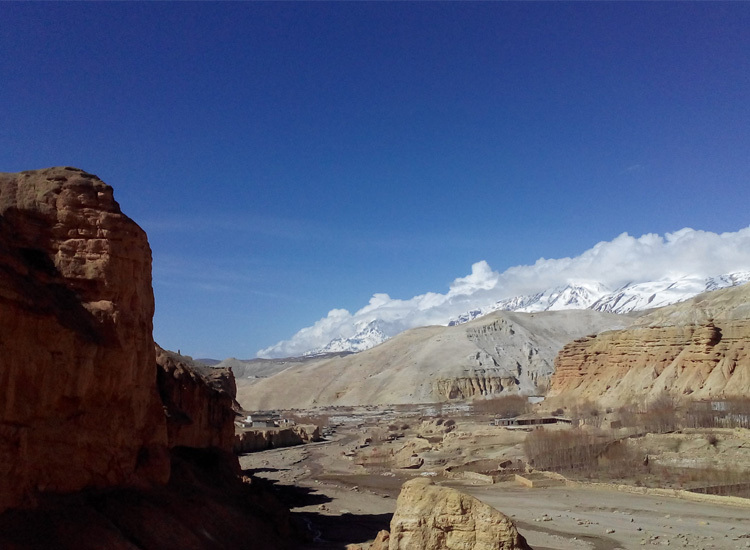 Surrounded by mountainous plateaus in the east and west, Upper Mustang is renowned for its contrasting natural beauty. An arid land with bare hills, imposing silver vistas of snow-capped mountains and rich seasonal colours. It is a luscious green during harvest months and crimson throughout Autumn. 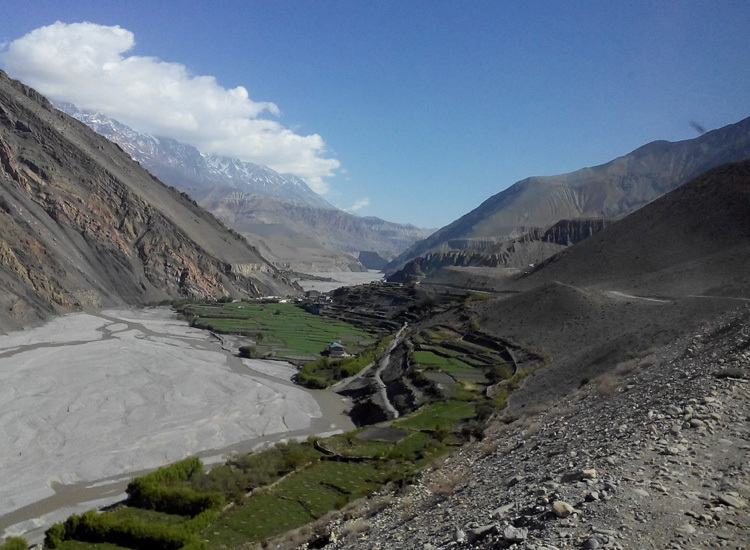 Upper Mustang has two distinct regions. The northern area belongs to the surviving walled-in kingdom of the Lo introduced by Ame Pal in the 14th century. Languages, culture and traditions of the Lo are almost purely Tibetan. The southern part has five villages inhabited by Manangi descendants. 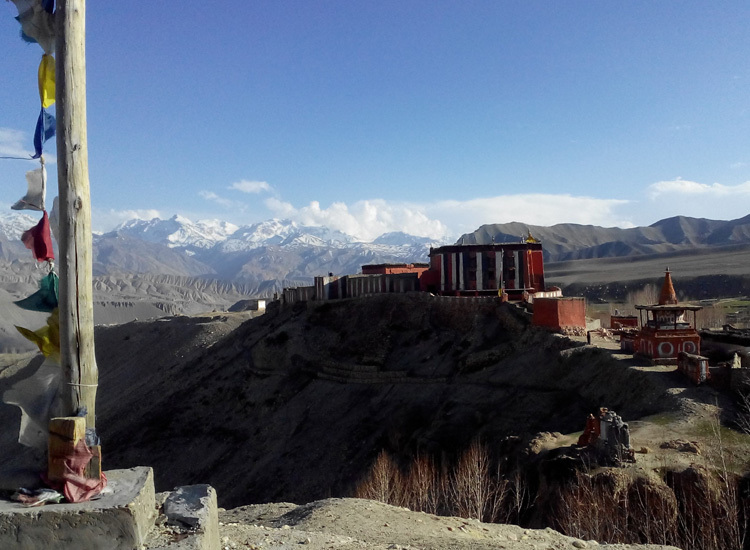 It is home to Jong Gharpu, a 5-storey mountain cave which in ancient times was fitted out with 44 rooms, and to Muktinath (ChumigGyatsa), a major settlement, holy place and pilgrimage for Buddhists and Hindus. 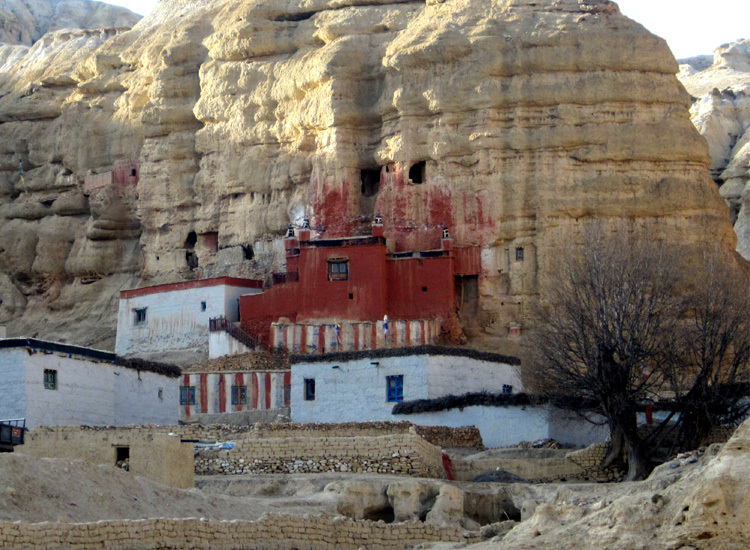 Until recently, Upper Mustang was isolated with very limited travellers able to enter this sacred region. Distinctive features of medieval Asia are present with mud-walled towns arranged in a circular pattern; village entrance gates flanked with local carvings of sinister figures warding off evil spirits; and monasteries covered in original frescoes. Ecosystem: Trekkers must be issued a special permit through a registered trekking agency. We request experienced trekkers to enquire about extended permits for loops accessible from Lo Monthang. The permit fees for the first 10 days per person US $500 and After 10 days per day per person USD50, Or equivalent convertible foreign currency. + Visit the Muktidahara holy bath with 108 waterspouts,Jwala Mai temple set above a spring housing three eternal flames, the Buddhist-Hindu temple of Vishnu/Chenrezig, and several marvelous monasteries in Muktinath. The day is spent visiting UNESCO World Heritage and cultural sites of Kathmandu. You will visit to ancient Buddhist and Hindi holy sites Swayambhu(Monkey Temple), planet's tallest Boudha Stupa, open cremation and sacred Hindu Temple Pashupatinath. After visit these three places return to hotel and prepare for trek and explore the tourist hub of Nepal Thamel where you can easily find all you need for trekking. Or if you just want to relax there are many cafes and bakeries serving excellent local tea and coffee. It is best to avoid the street food. We fly to Jomsom. We will enjoy the spectacular view of Fishtail Mountain, Mt. Dhaulagiri and Annapurna Ranges with its some popular peaks on both side from the plane. We will experience the distinct changes in the geographical appearance as the plane approach higher to the northern side. After 30min of flight, the chilling weather will welcome us to Jomsom airport. Here we meet with the rest of the trekking staffs and we follow the Kali Ghandaki valley to Kabbeni. We will enjoy the majestic view of Mt. Dhaulagiri, Mt. Nilgiri and Tukche peak while walking against the direction. 3-4hr of walk, the gate way to restricted area of Lo Manthang (Kagbeni) will reach. We start our trial from the east side of Kaligadaki river bank with the spectacular morning sunrise. Our journey passing the high ridges, we will observe some remarkable caves and Gompa Kang on the west side of the Kali Gandaki River. 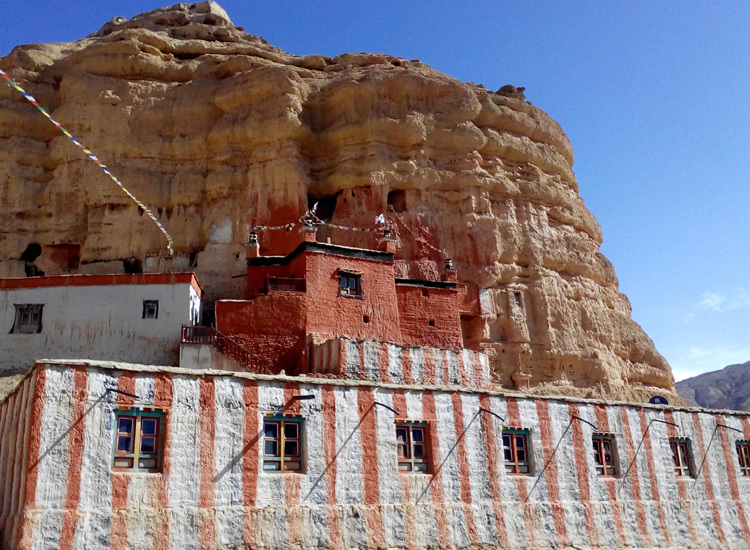 Soon we arrive picturesque at Tangbe village by passing the trio of black, white and red Chorten that represents the Upper Mustang. The village is the labyrinth of narrow alleys among whitewashed houses, field of buckwheat, barley, wheat and apple orchards. It manifests the conspicuous view of Mt Nilgiri on the southern part of skyline. The typical village of Chugsang is half an hour beyond Tangbe situated at the confluence of the Kaligandaki River and Narshing khola. Up the Narshing khola is Tetang where there is a gompa and salt mine. After crossing the river of Chugsang, we see some spectacular sight of red eroded cave. The vast Kali Gandi valley gradually narrowed and more meditative caves are perceived over the high cliff where there is a tunnel through which Kaligandaki river flow out under the steel bridge. Further short ascend walk on rocky gully trail bring us to Chele. Chele is one of the pretty village offer us comfort accommodation. Our next journey starts with climb on loose rocky slope from where gradient ease. By leaving Chele, we have a wonderful sight of Gyakar village with its fields surrounded by the stone with mud covered wall which lies far away across the deep canyon. The trial continues to climb on the long, steep, treeless and waterless reach at the pass. After a long descends leads to some chorten and further more walk will reach at Samar Village. The resting point for all travellers and the horse caravans where it provides horse stables and camping space. Next we climb above the summer village to the ridge and after sometimes we descend from thick junipers trees and reach to Bhena. The trial climb slightly up to Yamda, further climb some ridges and descends with emerging spectacular view of landscape reaches at Sangpoche. We will again slightly climb to a pass and reach to another valley. There is a junction of trial in the valley, from which left trial leads to Nyi la by passing Geling and other descends to the beautiful village of Geling. 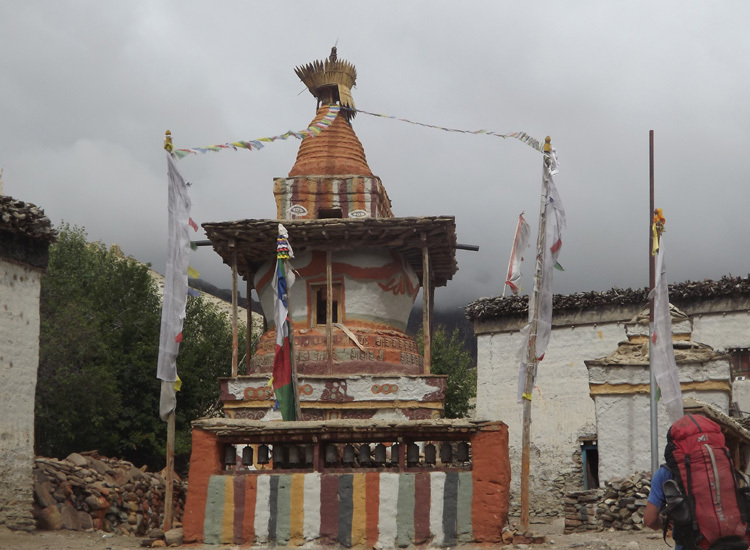 We start our walk gently through the field by passing the typical village of Tama Gaon and its imposing chorten. The trail regions the main route to the Nyi la after continuous climb to the pass. This pass is the southern boundary of the Lo itself. We will have a wonderful and gentle descends from the Nyi la pass and after half an hour is a junction, the right trial is the direct route to Charang, the left trial lead to Ghami. The Charang trial descends to the Tangmar Chu River and it passes the steel bridge over there. After gentle climb is the long stretched red wall called Mani (the longest Mani wall in Nepal) is observed on the way. The red coloured cliff to the northeast part from the Mani wall has a spectacular sight with its beautifully eroded shapes. Another pass has to be ascend and the gently descends of the routes lead to Charang village. Our initial section of the walk commences with gentle ascend and far ascends to the steep rocky trial to the cairn at ridges opposite to the Charang village. Further we climb towards north and passing the giant isolated chorten which marks a boundary between Tsarang and LoManthang. Then the trial passes the stream and desert like landscape with hue of grey and yellow is crossed. The giant cliff with several caves on it is perceived on the right side while heading towards Lo la (pass). Following the trial for sometimes reaches Lo la from where it views the spectacular sight of Lo-Manthang city and the neighbouring villages. The muddy trial then descends from the Lo la reaches to the stream and climb up to LoManthang plateau we have marvellous site of giant wall which encircle the city. The main entrance of the walled city exists to the northeast side. Inside the walled city, it contains the five storied royal palace, three large monasteries. Himalayan Amchi Museum and local houses. Lo Manthang Choedey Monastery is the main Gompa of the city which is located to the northwest part of the walled city. This Gompa carries all the monastic activities like Buddhist text schooling, Buddhist rituals performance, teaching Buddhist philosophy and so on. It also takes care of the preservation of the Buddhist ancient thanka paintings, precious religious text, and antiquity of monastics belongings etc. 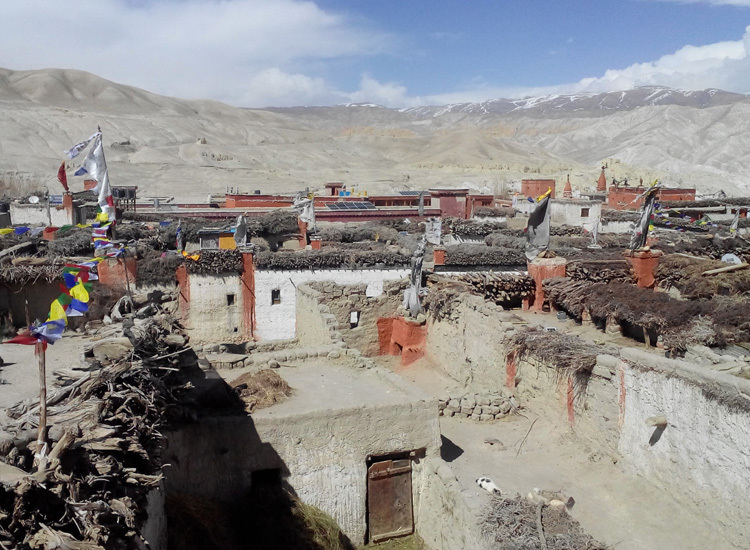 This monastery belongs to the Ngor Sakya clan of Tibetan Buddhism. There is a saying that in 17th century, the king Sabdung Rapten invited his religious teacher Jamgong Ngawang Kunga Sonam to Lo-manthag and later during his stayed in Lo manthang (in the Choedey Monastery) he introduced the popular festivals of Tiji (rituals dance perform by the Lama). 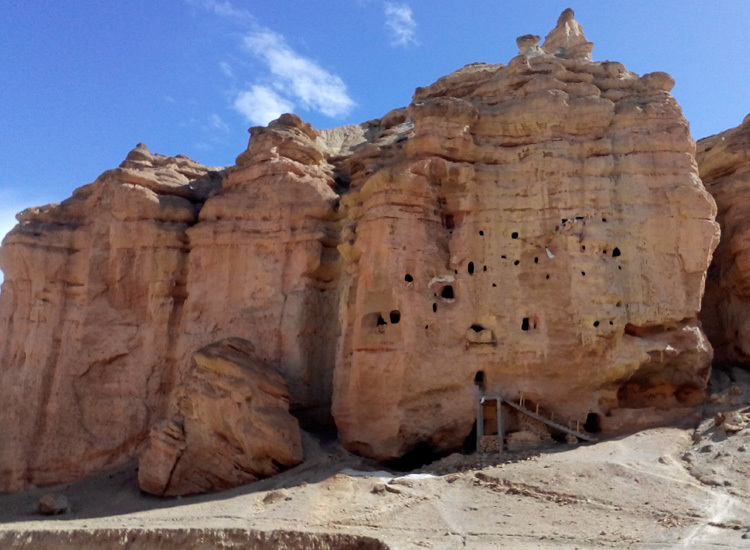 The monastery also features the museum where one can visit the antique collection of art, sculptures, scriptures and copper wares related to ancient civilization of Lo manthang as well as the whole Lo kingdom. With indelible memory of Lo-Manthang we return to southwest avoiding the oute to Tsarang which go down towards the south. We follow the trail which leads through the fields of Lo -Manthang city and following the irrigated canal. The trial to Lo Gekar is not a main trading route as it follows the indistinct trail of herders which makes crisscrossed on the hills. 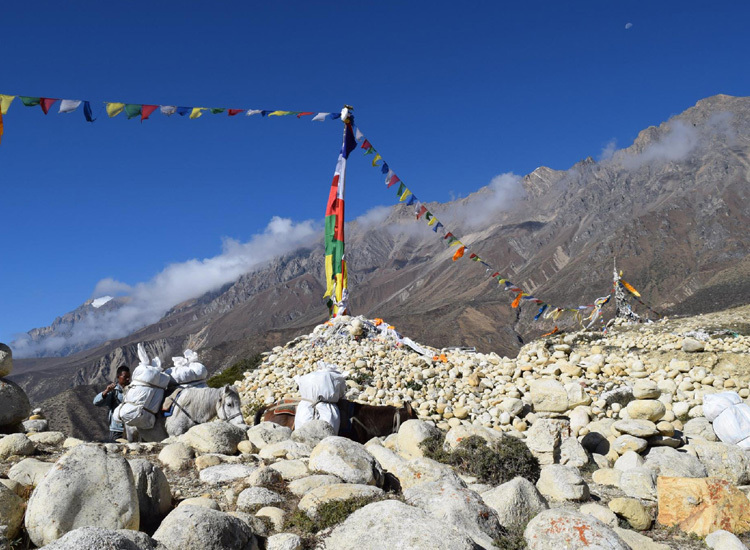 We have to climb up straight to the cairn of pass from where it gives a final glimpse to Lo Manthang, the trial climbs the ridges, reaches another huge cairn making a pass and further more climb will arrive the highest peak of the trek Cho Go La (4270m). Then we will enter the grassy valley where trials lead to a long ridge, furthermore descends from a short steep gully arrives Charang Khola and by passing some Chorten arrived Ghar Gompa. After visiting the Gompa (8th century, oldest Gompa of whole Himalayas including Tibet), we climb the ridges to cross the pass and enter the alpine meadow and steep town to the gully which is over shaded on the top with red color. There is a myth on red cliff that the red colour is the blood of Ogress which once vanquished by Guru Rinpoche. Now soon our journey brings us to a beautiful village of Drakmar. With astonishing site of landscape intensify by the morning sunrise we start our trek which goes down with the stream passing the stone walls and the fields of Drakmar. The trial then climbs the ridge to the chorten and again descend to another stream is small climb and we follow the trial till Ghami la which contouring to the Nyi la. Descending the steep trial to the Geling valley but stay high by passing the Geling village and later gently walk down the Chungar, a large Chorten, house and camp sites. 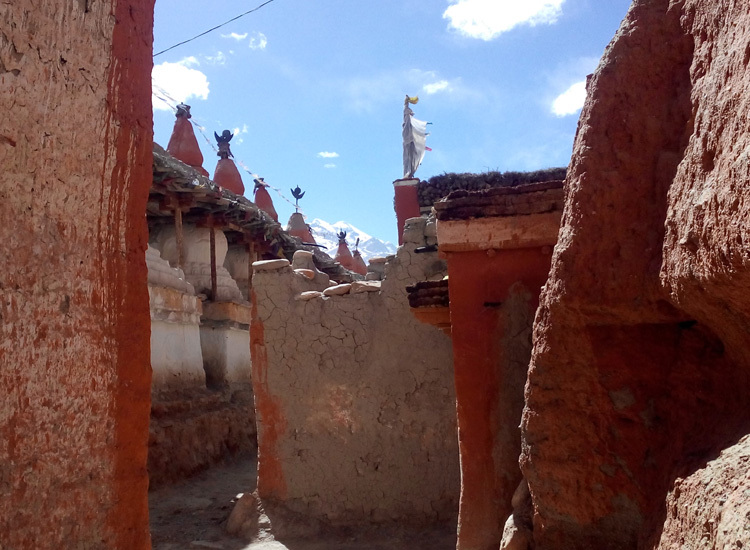 The trial passes the Mani wall and the three typical houses of Tama Gaon, which later leads down to the rocky canyon to the stream and turn up to the Shyangboche La. We will see huge painted Chorten before re-joining with Giling trial. Our trek of the day end after descending the Shyangboche la and reach to the village of Shyangboche.